In 1869 F.Miecher isolated unidentified substance from pus cells. He gave the name nuclein, later Altmann introduced the term 'nucleic acid'. All living organisms contain two types of nucleic acids namely DNA (Deoxyribo Nucleic Acid) & RNA (Ribose Nucleic Acid). 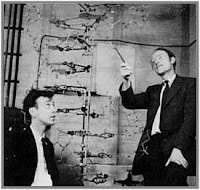 James Watson & Francis Crick (1953) proposed the model of DNA. 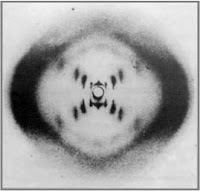 The model of DNA they proposed was based mainly on X-ray diffraction pictures taken by Maurice Wilkins & Rosalind Franklin. Biochemical evidences from the work of Chargaff also helped in proposing the three dimensional model of DNA. James Watson & Francis Crick shared Nobel Prize with Maurice Wilkins in 1962. Almost all the DNA of eukaryotic cells is found in the linear chromosomes of the nucleus. Small amounts of circular DNA are found in cytoplasmic organelles such as mitochondria & chloroplast. Adenine & Guanine (double ring nitrogenous bases) are purines. He found that in DNA the concentration of adenine always equalled the concentration of thymine and the concentration of guanine always equalled the concentration of cytosine ie. the amount of purine=the amount of pyramidine in a given DNA molecule. DNA contains many mono deoxyribo nucleotides covalently linked by 3’5’-phosphodiester bonds. The resulting long, unbranched chain has polarity, with both a 5’end and a 3’end that are not attached to other nucleotides. The sequence of nucleotides is read as 5’-3’. DNA exists as a double stranded molecule (A few viruses ØX174 contain single stranded DNA as genetic material), in which the two strands wind around each other forming a double helix. The two chains are paired in an anti-parallel manner that is the 5’ end of one strand is paired with 3’ end of the other strand. Most DNA molecules are right handed double helices. The stacking of the paired bases by their flat surfaces in the center of the molecules to forms a hydrophobic core. Together with the hydrogen bonds between the base pairs, these hydrophobic interactions contribute to the stability of the molecule. DNA is negatively charged, why? 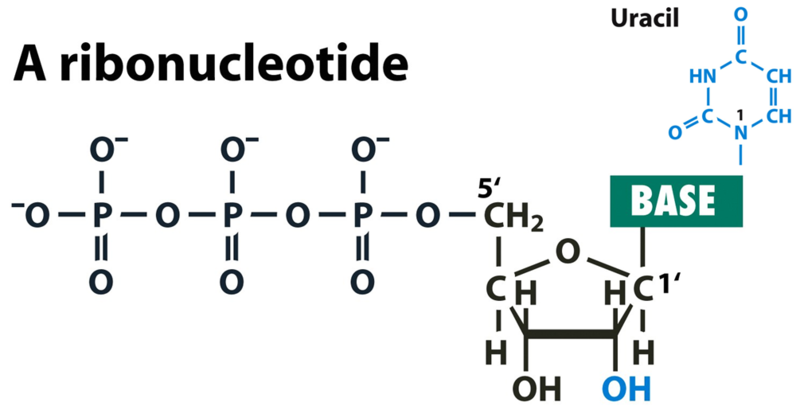 At neutral pH,there is no charge on any of the bases, but the phosphates on the surface of the DNA molecules are ionized, giving the molecule a net negative charge. The ds DNA has 2 different grooves: a major groove and a minor groove, where interactions between specific nucleotide sequence and specific DNA binding enzymes (like DNA polymerase) may occur inorder to activate or repress a gene action. All RNA molecules are synthesised from DNA templates. Most RNA molecules that are synthesised & processed in the nucleus soon find their way into the cytoplasm, there they function in the synthesis of proteins. 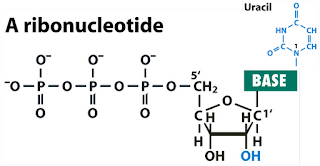 RNA is a polymer chain of ribonucleotides joined by 3’5’ phosphodiester bonds. How RNA is different from DNA? The covalent structure is very similar to that for DNA except that uracil replaces thymine and ribose replace deoxyribose. r RNA is the most abundant RNA and constituents 70-80% of the total RNA. All kinds of RNA are formed from a template strand of DNA, catalyzed by enzymes called RNA polymerases. How to determine the concentration of nucleic acids? Nucleic acids absorb UV light due to the conjugated aromatic nature of the bases. The absorption properties of nucleic acids can be used for detection, quantitation and assessment of purity. The approximate purity of ds DNA preparations may be estimated by determination of the ratio of absorbance at 260nm and 280 nm (A260/A280). For pure DNA, the value is 1.8. Values above 1.8 suggest RNA contamination and those below 1.8 suggest protein contamination. DNA can be melted (to form single strands) in solution by increasing temperature (Tm) or decreasing salt concentration. Heating DNA to 1000C lead to the breaking & separation of the two poynucleotide chain, called denaturation whereas, slow cooling of heated DNA solution will lead to pairing & formation of double helix, called renaturation or annealing. Renaturation kinetics is used to assess the complexity of genomes. ds or ss DNA has more absorbance? The absorbance of isolated nucleotides is > ss RNA or ss DNA>ds DNA. The increse in absorbance of ss DNA over ds DNA is termed as hyperchromic effect. In otherwords dsDNA is hypochromic with respect to ss DNA. Hyperchromic effect is due to the presence of exposed nitrogenous bases in ss DNA. Higher the GC content higher the Tm will be. This is due to the presence of 3 H bonds between G&C compared to 2 H bonds between A&T.